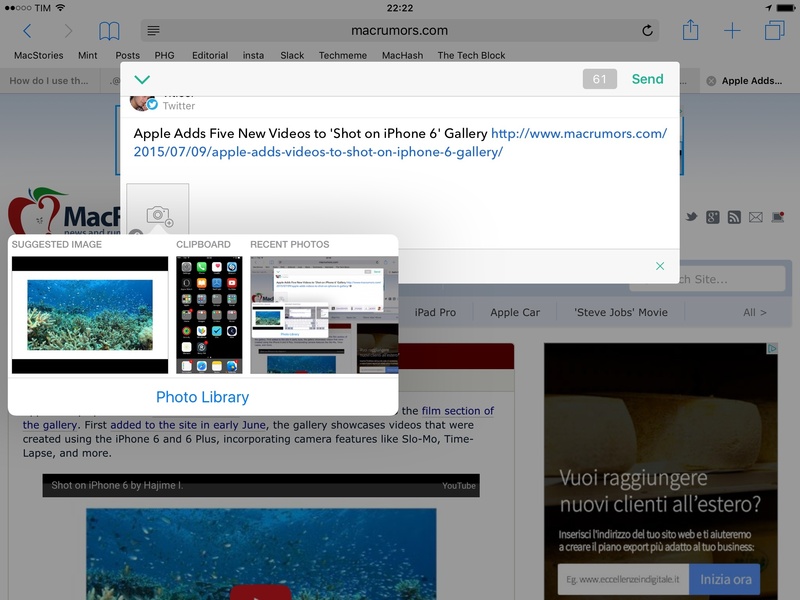 Linky the share extension is a great way to tweet links from Safari on iOS 8. Once enabled, Linky will appear as an extension of Safari and other apps that can share URLs such as Instapaper or a Pinboard client. The design of the app’s composer is minimal and easy to understand. You can switch between accounts by tapping the profile picture, tap buttons to insert the title or link of a webpage (if they’ve not been automatically inserted), and there’s a character counter in the bottom right. 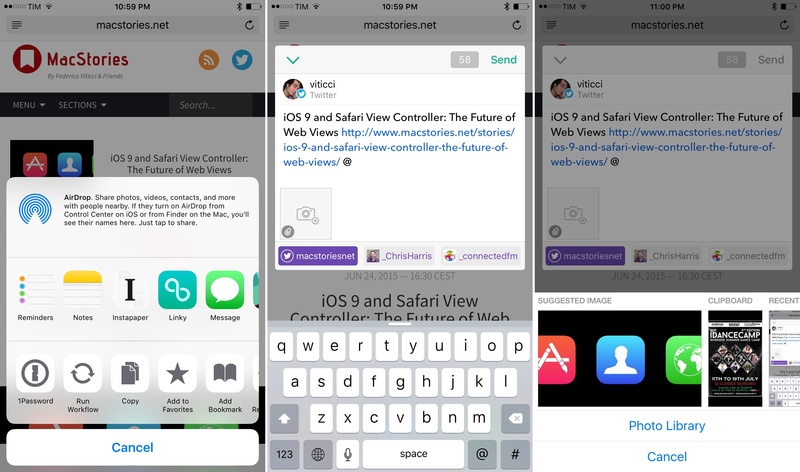 For the past nine months, I've been using Linky every day to tweet links and quotes from Safari and other apps. Unlike the built-in Twitter share extension, Linky comes with thoughtful touches such as highlighting for links and text that exceeds the 140-character count – if you share dozens of links on a daily basis, the convenience of details adds up, and Pragmatic Code found a good niche for Linky to thrive. The problem with Linky was that it worked well for text, but it didn't have support for images. Tweeting screenshots from my camera roll or so-called textshots accompanying links to articles has become a common practice for me, but Linky couldn't be part of my social sharing workflow whenever I needed to post something that wasn't just text. Linky 5.0, released today on the App Store, wants to fill this gap with built-in support for images – but like prior releases, there are several hidden details that make the experience of sharing with Linky superior to alternatives on iOS. The big new feature in Linky 5.0 is that the app now accepts text and images in its share sheet. 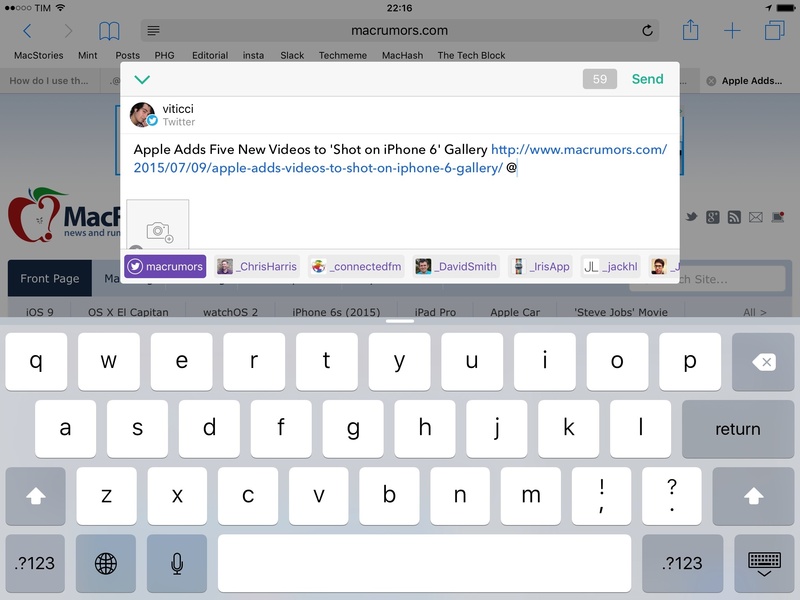 This is reflected in the app, where you can hit the Compose button to share, but most notably in the share sheet available as an extension to every app that supports extensions on iOS 8. Sitting in the lower left corner of the sheet, a new camera button opens a photo picker that displays recent photos you can scroll through to attach one to a status update. In the couple of weeks I've spent using Linky 5.0, this change alone has made it easy for me to take a screenshot of an app or webpage and include it with a link or quote shared from Safari. The ability to include an image without jumping back and forth between Safari and Photos is a good showcase of iOS' extensibility features, but I've also been using Linky to simply share images from Photos because I like its UI. There's more. 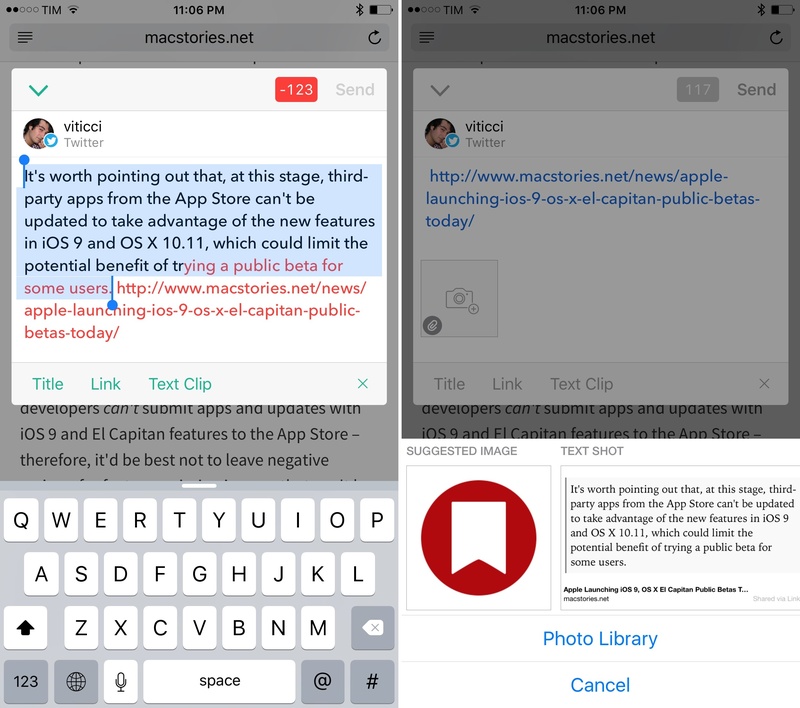 Besides the ability to preview all images before sharing them (tap to preview in full screen) and support for images copied to the clipboard (useful when you don't want or can't save an image before sharing it), Linky has added support for meta tags that allow the extension to automatically offer a suggested image every time you want to share a link from a webpage. The way this works is surprisingly clever: if a website supports meta tags like Open Graph and Twitter Cards, Linky can use them to fetch a relevant image, plus other information. You can try this out with MacStories: select an article with an image, bring up Linky, tap the camera button, and the first image of the article will be automatically suggested by the app – this is the same image that is attached to every link shared by @macstoriesnet on Twitter.1 While this is not a foolproof method to ensure you'll always be sharing the most contextual image alongside a link – it depends on a website's integration with Open Graph and Twitter Cards – it's a good timesaver in most cases, and it shows how web meta tags can be used to augment traditional app experiences in interesting ways (expect more of this from Apple, of all companies). Twitter Cards are also used to fetch an article's associated Twitter account and simplify the process of mentioning it. When you're on a webpage that supports meta tags and hit the "@" character to start a mention, Linky will automatically highlight the website's Twitter account in purple and put it first in the list of suggested accounts in the bottom toolbar. Again, not a game changer, but a handy shortcut that can shave off precious seconds you'd spend remembering the name of a Twitter account every time you're sharing a link with your followers. It's telling – and somewhat ironic and sad – that not even Twitter is taking advantage of Twitter Cards in their own share sheet. Last, textshots. While a lot has been written on the downsides of sharing text as a static image (and I agree with the accessibility concerns raised by many), the truth is that, as an occasional workaround, sharing small snippets of text as embedded images works. I try not to overuse textshots, but whenever I come across a slightly longer quote that can't fit in a tweet, I don't mind the convenience of a paragraph turned into an image. Linky makes it easy to select clipped text and turn it into a textshot. Linky 5.0 introduces built-in support for textshots based on what is currently selected in Safari: select some text, bring up Linky from the share sheet, and a textshot will be offered as an option in the image picker. These textshots are generated dynamically based on what is selected on the webpage, and they don't pollute your camera roll with new images. Linky's textshots are similar to Instapaper's and they're good enough – I'd only point out that formatting is lost in the transition to textshot and that you can't pick styles for fonts. I continue to believe that most people don't need an app like Linky, but if you share links and quotes from the web on a daily basis, this is a must-have. Linky became one of my most used apps last year, and today's update extends the app's capabilities to images, which should allow even more users to enjoy the advanced sharing features of Linky. There are other new options I haven't mentioned, such as better integration with Facebook audiences, a redesigned account picker, and improvements to the app's URL scheme. There are also minor issues I noticed – such as the aforementioned lack of formatting in textshots, and the fact that Linky can't share multiple images on Twitter at once (for that, you'll still need a client). These problems, though, don't change my overall opinion of the app and the work that went into this update. Linky 5.0 removes friction from sharing links, quotes, and images. I appreciate the intelligent use of Open Graph and Twitter Cards to save even more time, and I'm a fan of the deeper controls Linky brings when compared to the default share sheets of Twitter and Facebook. I can't recommend Linky enough. Linky is $3.99 on the App Store.